Pehalgam, the valley of the shepherds is where large communities of the shepherd tribes of Gujjars, Bakarwals and Chopans reside. 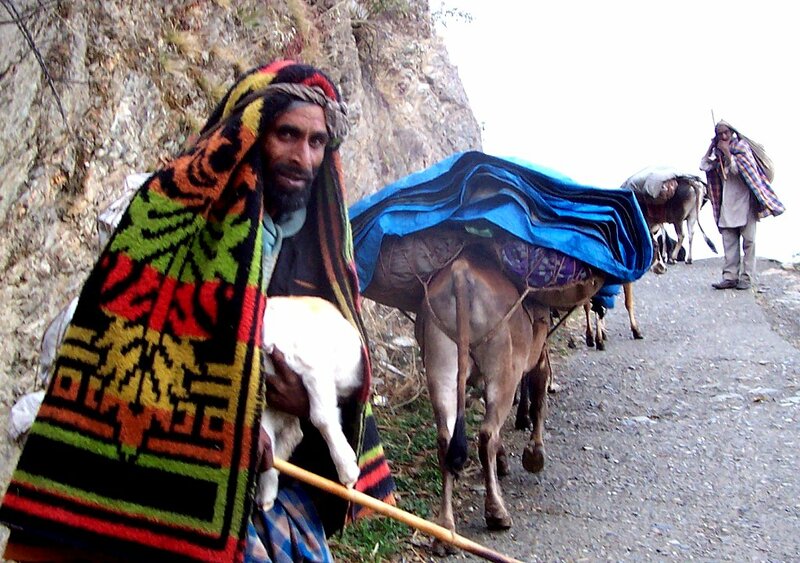 Barring the Chopans, the other two shepherd communities follow a migrant lifestyle. The Gujjars herd their stock and travel up and down the mountains in southern Kashmir flitting between two bases according to the weather while the Bakarwals traverse a far longer distance, camping overnight at various hillside meadows spending their summers in the upper reaches near Ladakh and going all the way down to Poonch, Rajouri and even Punjab during winters. Pehelgam falls midway and so is often host to several little groups of people and their livestock for most part of the year. 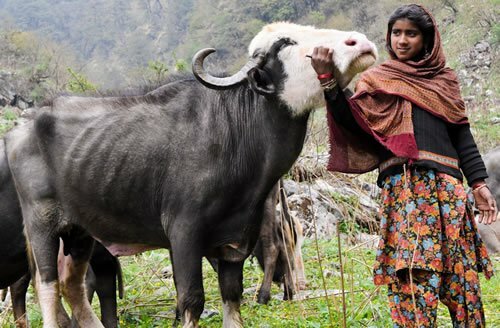 The busy season for migration is in April- May when the Bakarwal move uphill towards Ladakh from the warmer plains and in September – October when they leave their freshly snowed in pastures, back to warmer plains. 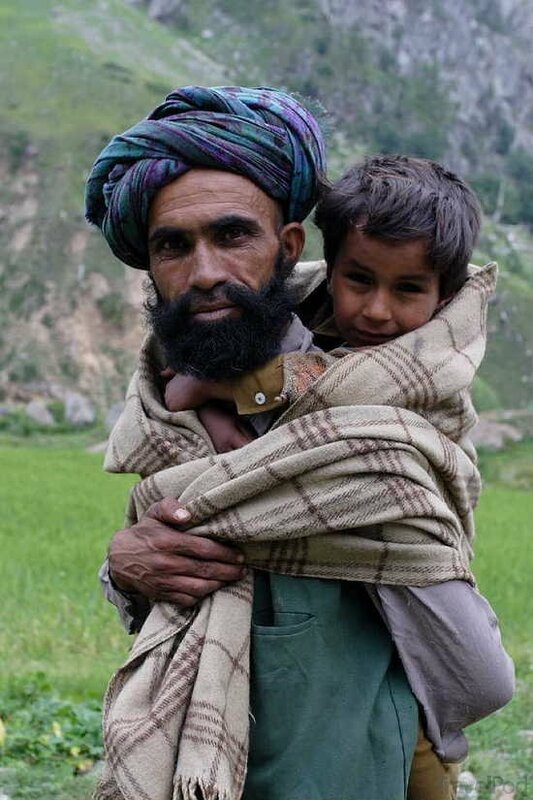 The Gujjars live in hamlets either remote on the mountain slopes or on the fringes of lesser known villages. 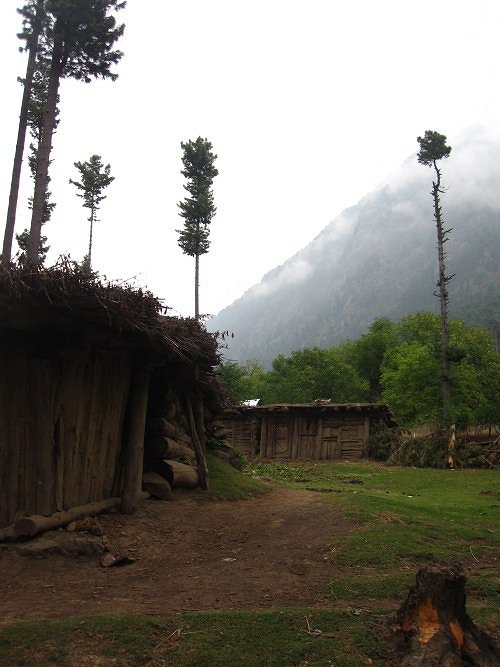 Several live in traditional homes made from mud and wood logs, with a low roof that sprouts grass, making their hamlets seem surreal – stubby little grassy dwellings in the midst of tall pine forests, dappled sunshine, mist from passing clouds, green grass and gurgling little brooks with agate green water, chalky from the sediments of the glaciers they flow from. They lead simple lives, sharing their bare homes with their cattle/ livestock and often having a mere wooden chest separating the two spaces. They eat corn, wheat or whatever the grain that grows there, make a delicious cheese called the kilaari and are largely illiterate. 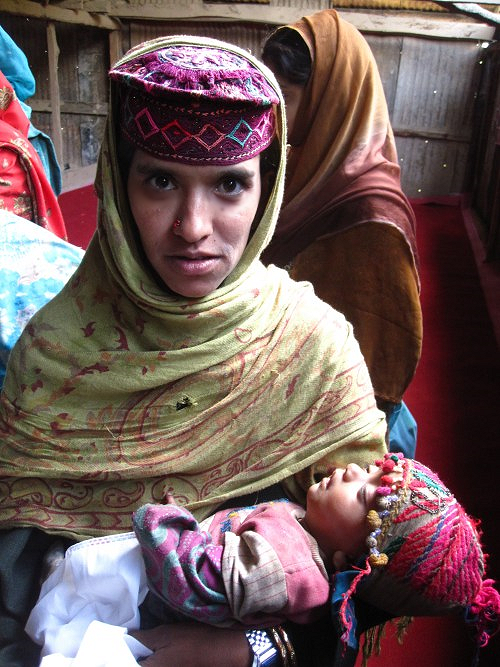 The women and children wear caps typical of their brood, small, ill fitting and rimless, they have a broad tail that runs down the base of their necks to their backs. These are made from coarse cotton in a dark hue of black, maroon, blue or red and embroidered with bits of bright cotton yarn interspersed with deep maroon. The motif is typically radial on top, done in a variation of satin stitch with rounds of blanket stitch and herringbone with a flat vertical band forming a rim or sides in chain stitched repetitive motif. The tail is a separate piece with geometric embroidered spaces in running stitch, rows running parallel to form patterns of their own. The infant caps are embellished with tassels, beads and pom poms on the rim, sometimes with little coins stitched in. the base cloth here is lighter in colour and all the thread is bright – ho pink, yellow, turquoise, emerald to name a few. These do not have the flat tail but have flaps on either side to cover the ears. The women also wear hand braided tassels in their hair which is already fashioned into thin even braids that combine to form two thick ones ending in these bright, woolen tassels and pom poms. They also wear broad chokers made from coarse seed beads in glass, hand strung in cotton without using needles. There are also braided cords in wool with pendants made from old coins. Some of the older women wear chunky metal jewelry made from a mix of metals including tin that makes it look like silver. They fashion bags and pouches from old clothes and embellish them with their style of embroidery. Their mules are adorned in saddles and blankets with the same embroidered motif and have straps, ribbons and decorations in braided wool and beads. 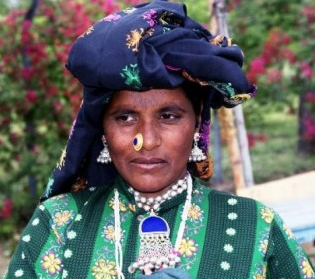 The Bakarwals too have their distinct style of embroidery, more coarse than the Gujjars with a larger array of stitches and motifs. They also embroider on plastic cement or rice sacks, jute, blankets and pretty much any surface they plan to use in their daily lives. These people were never a part of the 20year conflict that robbed the valley of its peace and is still recovering from. They were not interested in the freedom struggle, militancy nor had they any political leanings, too busy in their everyday search for fodder and food, too poor to indulge in any ideological rhetoric. This, in a way has also left them alienated in the current post conflict era, ignored by the powers that be that are aiding the economical and social development of Kashmir. Their migrant lifestyle hasn’t helped either. Pehalgam is home to several little hamlets and is in itself a picturesque little valley in the high mountains straddling the river Lidder that twists and turns all through, its water changing colour at every nook from a patina green to a milky turquoise to jade, agate, deep green and gray. 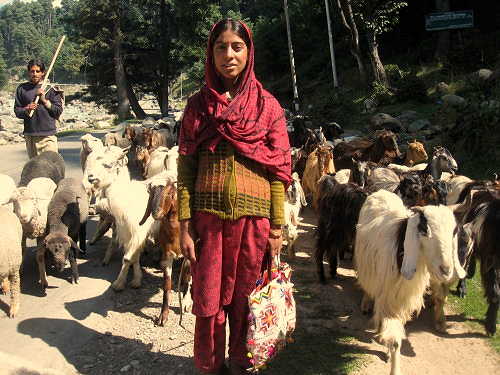 The mountains are thickly pined with small green pastures and a smattering of the traditional Gujar homes. A well maintained building law bans people from any form of construction, even repairing a broken window or a torn tin roof will need permission from the high court in Srinagar. This has helped preserve the green of the valley though one does see signs of the omnipotent corruption as chateau style homes crop up in the wilderness every now and then. I sincerely hope these are as per the law and not as per my pessimistic outlook towards the prevalent beaurocracy! 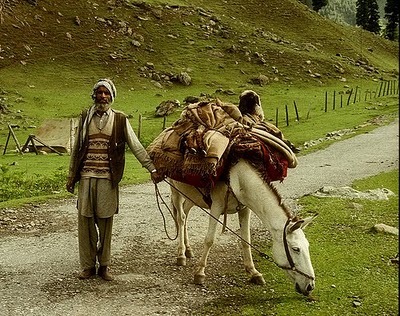 Any way, coming back to my sojourn, my friend Ramneek grew up in Pahalgam and has always wanted to help the Gujjar community in some way or the other so that they earn a better livelihood and are brought on the map alongside all the other Kashmiris. She is a crafts aficionado and together with another friend Renuka, runs a business of marketing genuine Kashmiri crafts to discerning buyers in and outside Kashmir. She proposed we do something together for the Gujjars. I was more than willing to help – for how often does such a dream opportunity pass one by. It was settled then that I’ll pitch in all my interpersonal skills and “livelihood projects” know how voluntarily while she took care of the actual expenses on initiating the project. This saw me on a flight to Srinagar late September, all excited and full of plans and sketches in my suitcase and in my head based on whatever information I could gather off the net on the community – which is to say – barely anything! 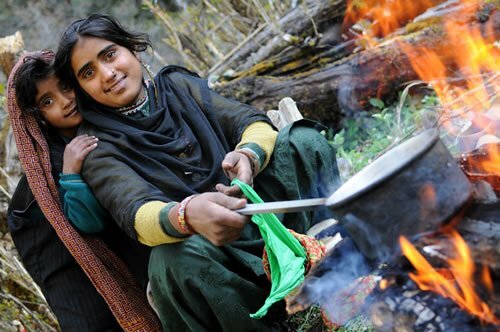 Fortunately, Ramneek and Renuka had got together a small group of women from Khedam, a village that’s an hour away from Pehalgam. They gave them scarf sized squares of cloth and bright yarn with the brief of embroidering whatever the women wished just so we had a basic visual rhetoric to ideate from. These were then sent to me in Bangalore, where I got to work making patterns and motifs based on them. Unfortunately, these women, in their bid to impress us city dwellers, covered the cloth bits in chain stitch embroidery aping the ari or crewelwork of Kashmir! 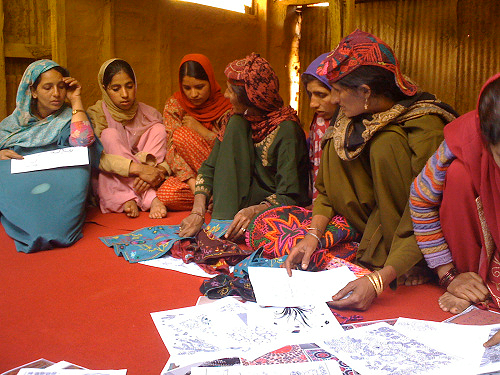 So, of course, without any thought, I had developed a whole library of designs – enough to keep 30 women occupied over 15 days during my workshop in Pehalgam. It took us exactly 3 hours together to figure that these were of little use as the women were awkward at following floral motifs and preferred to follow free hand embroidery! Ramneek has this lovely patch of meadow strategically located on route to Pahalgam, 6 kms before in a village called Langanbal. There is an old Gujjar structure, dilapidated with tin sheet walls and roof, rotting wood beams and shuddering wood planks for a floor. The back wall is only half there which is in fact a blessing as we are constantly in view of the pine forest sloping uphill to a clear blue sky. She, with the help of her father’s hotel staff, had it carpeted and made hospitable for the workshop. It was so rustic and in keeping with the Gujjar idiom that the 25 women who joined us for the workshop felt instantly at home and got to work immediately, carving little corners for themselves and their friends, spreading outdoors to soak in the sunshine on colder days. We had a good turnout of 23 women on the first day and had to send away several in the days to come. Of these, only 3 knew the traditional embroidering technique while the majority were young teenaged girls, unskilled, out of school, married and some even with infants! So our strategy has to change once again! We let the experts Ameena Jan, Mariam and Zulekha do their own thing on cloths we provided once we explained how colours work. It was a learning for me too as I realized that they have no names for colours like green, purple, orange. My usual style of referring to oranges and parrots etc didn’t work, as they’d never seen any of those before! All shades from yellow to parrot green are called “pillo” which means yellow in Hindi and all shades from emerald to deep blue gray are “nillo” which is blue in Hindi. There’s Kallo for black, brown, maroon and gray. We had a colour nomenclature session just to make sure all of us were on the same page thence. Blues were christened “asmaani” (sky), light green was sev (apple), browns were ghoddo (horse)….. The next day saw 4 new women, two of who knew braiding. They braided flat straps out of wool and rounded cords too with pom pommed ends. One of them was the wife of Ismail, the young man who maintains the premises. The other 2 were sent home with the promise of recruiting them in 6 to 8 months when our first batch is experienced and set in the rhythm of work. 2 women did not show up. 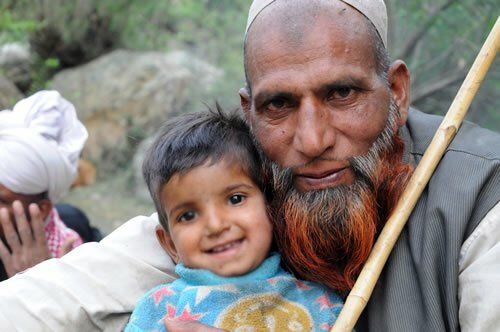 Ramneek’s father organized a health camp with the help of two of his friends who were doctors. We had asked the women to inform everyone in their villages about the camp and we had a good turn out of men, women and children of all ages. There was even a teacher with a bunch of kids from a local school! Within the first half hour, we realized what a mammoth task we had undertaken. Most of the people are under nourished; the women and children especially needed calcium and vitamins. Since they are covered from head to toe and live in dank, dark homes that are built to keep the cold out, they do not get enough sun and so have vitamin D deficiency. One of the women had complained of a headache that has lasted her at least 4 years and we discovered she had severe hypertension and was not even aware of such a malady. Ramneek’s father sponsored all the medicine prescribed and the same was distributed in the coming days. So many of the young girls who had joined us had been made to quit school and get married or help around the house. They would have to take care of all their younger siblings, cook and keep the house. None know their age but I would guess them to be between 13 and 16. Most would like to study if given the chance. We started maintaining a register for attendance and one for issuing and receiving work. The women loved shouting “yessir” when their names were called. On one of the days, young Jameela brought a friend along and was proudly showing her around and told her that it’s like a school, see, we even have a “yassir” (a common male name there) book! Raja, an elderly woman said she couldn’t do the embroidery but would love to string necklaces with small glass beads. She made a traditional one to show us how and we gave her beads we’d bought from Srinagar. When I went to her an hour later, I found she’d strung together a lovely interwoven necklace using 8 strands of wire. But the colours were all jumbled and made the piece look slapdash. So I showed her how to repeat colours – 11 blue beads followed by 2 white ones. She smiled and said it was a good idea and got to work. I met her again before we left for the day. The new piece was random too so I asked her why she didn’t keep a count of the coloured beads being strung like we’d planned. She laughed and said that counting was for those who knew numbers! The new method for Raja now is a nail’s width of blue followed by a thumb length of white followed by such readily available body measurements. Here’s hoping she sticks to using her fingers and thumbs and not of her grand children or friends! By the end of two weeks (12 working days of 3 hours each), we had several bag samples, some sure sellers like cell phone bags and small slings, others a bit more elaborate and based on Shepherd traditions like the saddle bag that’s two sided with a saddle like flap or the open pouch one can tie around the waist that was inspired by the little money/ tobacco pouches they carry. Envelope bags like theirs were made too. Most straps are braided variations of horse straps and décor with trims and pom poms. Earring, key chains and necklaces made from their typical beading technique were also developed. There is still a lot more to be done but time was running short. We had a short and sweet farewell. The older ladies came forward and hugged me 3 times in their traditional style – head to the right, then to the left and then right again while the younger ones shook hands and cracked jokes. Some wondered what they’d do the next day onwards to which Ramneek reminded them that the work has to continue and I’d return in April. One comment that especially caught my attention was when Saira said she wished I could be her brother’s wife, as then I wouldn’t have to go, as we’d have so much fun together! Thank you all at Pahalgam for making an alien from the tropic south and so at home in your chilly, wintry land. I now eagerly await the passing of winter so I can be back at the barn, amidst my newfound sisterhood, chatting and working and enjoying the onset of spring. The glaciation in the Indian sub continent continued for a long time. However, the formation of the Himalaya came into being about 25 million years ago. After its formation, this great mountain system remained under glaciers and sheets of snow and their melting continued till about 10,000 years ago. Since the emergence of the Himalaya and the surrounding plains was a gradual process, the settlement of human population in the Himalaya too was a slow exercise. 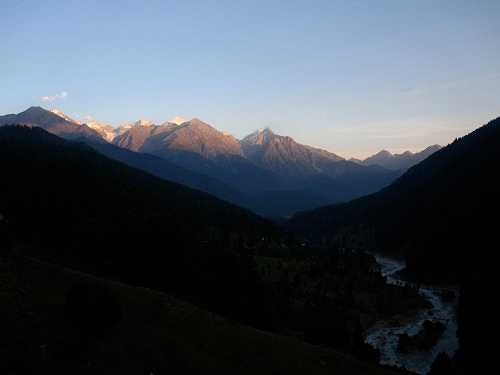 The early settlers must have chosen the outer Himalaya or the hills adjoining plains as their first abode. With the process of snow melting they must have migrated above in the vertical fashion thereby creating Himalayan settlements. The migration from one particular altitude to another above may have been necessitated by various factors like availability of additional area and the inherent quest of the human mind to explore and know new areas. It is, perhaps, because of these reasons that we find human settlements in Himalaya right from Jammu (aft 350 m) to Changthang (aft 5200 m). The accounts of human settlements in the Himalaya may have been lost in the antiquity, yet a fair assumption can be made about the “recent” settlers. 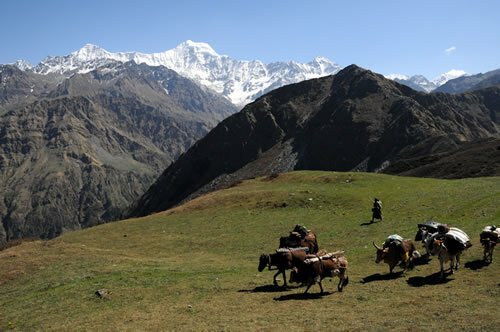 According to the recorded history of human transhumance and settlement, the Aryans came into Himalayan pastures during 1500 BC (Debenhem, 1977). By this time the Aryans of Central Asia had domesticated the horse and this provided an unlimited mobility to the Aryans. 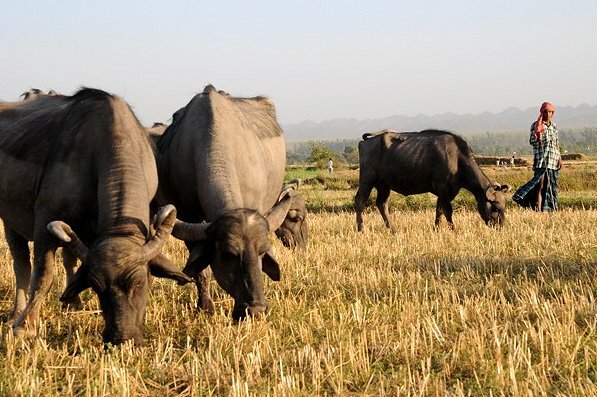 When they observed the vast potential of the Himalayan pastures, they migrated and initially settled here. Later, they spread to the plains and the entire north western India came under influence of the Aryans. The migration of the Aryans from top to down and the movement of original inhabitants from lower altitudes to higher ones gave rise to a number of ethnic identities in the Himalaya. However, the influence of the Aryans on transhumance and pastoralism, remained a dominant characteristic. The intermingling of the Aryans and the native population gave rise to various ethnic identities in this area. Most of these were initially pastoralists but later they took to settled agriculture. 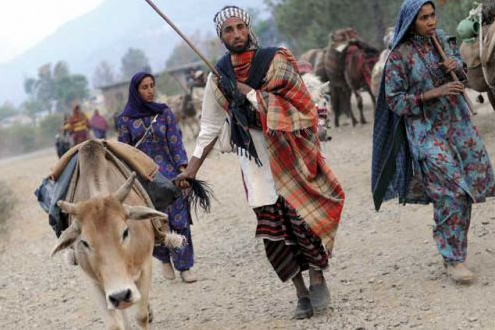 However, some of the communities maintained their tradition and are still practising the migratory livestock rearing. 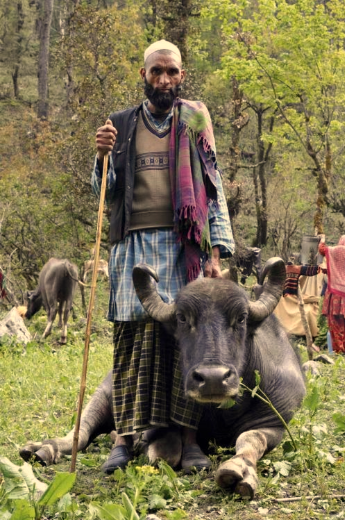 The most important communities are Gaddis, Bhotyas, Jahads, Changpas, Bakarwals and Gujjars. This paper aims at presenting the findings of a survey undertaken on the Gujjars of districts of Jammu and Udhampur of Jammu and Kashmir state. 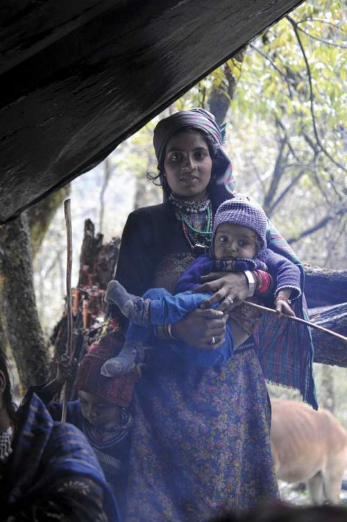 Anthropological aspects Though nothing can be said with certainty about the origin and rise of the Guijars, it is evident from various theories and hypothesis that they are an ancient tribe of India. It is, generally, believed that these people migrated to India before 6th century AD from central Asia and settled in Gujarat and Rajasthan. 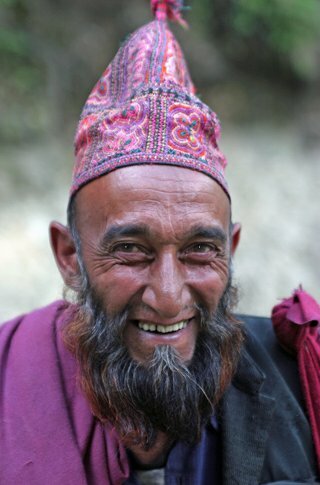 They are believed to be the descendants of the ancient Yuchis or Kushans. During 7th century, a devastating drought occurred in Rajasthan and Gujarat and some of the Gujjars migrated to the Shiwalik hills i.e; the outer Himachal Pradesh, Uttar Pradesh, Haryana and other Himalayan areas. 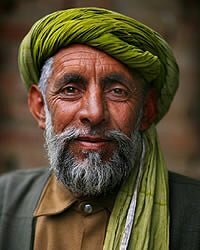 According to Cunningham, the noted explorer, the Gujjars are prominently present in every part of the north western India from the Indus to Ganges and from Hazara mountains to the peninsular Gujarat. 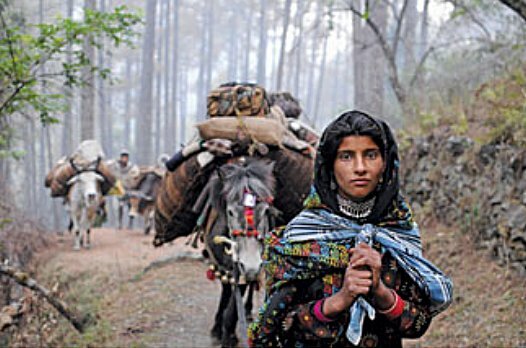 In Jammu and Kashmir, numerically they are the third largest ethnic group and are spread throughout Jammu and Kashmir. 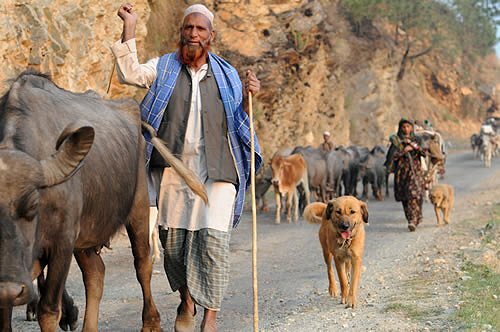 They are not found in Ladakh but some of them migrate along with their flocks of sheep, goat and cattle to Dras area of Ladakh. Ethnicity Initially the Gujjars were Hindus but during the rule of Mughal king Aurangazeb, most of them converted to Islam but retained their Hindu gotras or subcastes. The common gotras are: Bhati, Chandel, Chauhan, Baniya, Lodha, Bhensi, Chopra, Chechi, and Khatana. The Gujjars of Jammu and Kashmir have also retained these gotras and marriage in the same gotra is strictly prohibited. 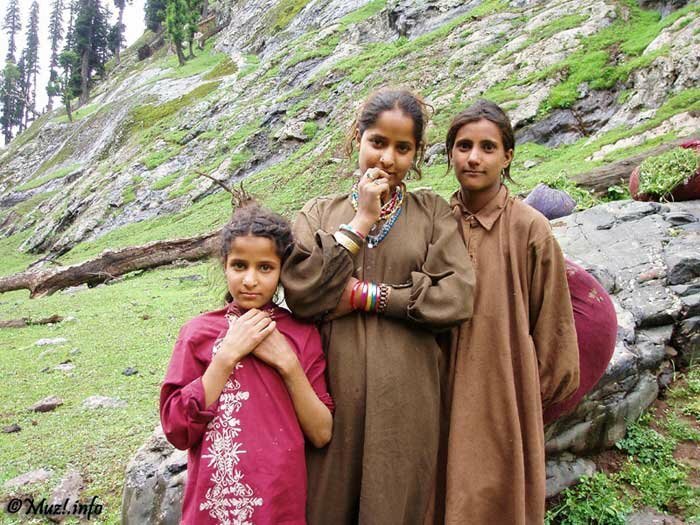 They speak a dialect which is different from Dogri and Kashmiri, the major languages of the state. The Shrine of Wanghat has always served as a consoling place of disheartened soulsAmong the tribals of Jammu and Kashmir the shrine of Mian Baba Ji Sahib at Wanghat is of great significance. Besides the tribals, people from the planes also visit the shrine. Situated in the lap of mountains, with pristine ambience the Shrine reinforces the collective consciences of Gujjars and Bakerwals of J&K State.The real name of Baba Ji (as popularly known) was Ubaidullah son of Mian Fazal Gul. He was born on Friday at Sanjwada Balakot Hazara (Pakistan) in 1960 Bikramie era. Saints had predicted to his father about the birth of a child who will excel in spirituality, and piety. Despite being illiterate his two books, Israr Kabirie and Malfuzat Nazimia are considered scholarly writings. Gujjars and Bakerwals give central importance to the shrine of Wanghat Sharief. The place first developed into a sacred site with the arrival of Ubaid-ullah Bijran from Hazara in the late nineteenth century. The immigration was instrumental for the transformation of the Bakerwals and Gujjars from an occupational category to one single ethnic group. The individuals and families accompanying Ubaid-ullah, formed the nucleus for the ethno genesis of this community, which in present J & K State, is a conglomerate of Sunni families from several ethnic groups. The Shrine of Wanghat which is held in high reverence by the Kashmiris in general and Gujjars in particular, is built at the graves of Ubaid-ullah and his son Mian Nizam-ud-Din. Ubaid -ullah popularly known as Mian Baba Ji was born around the middle of the nineteenth century in Sanjura, Hazara. Among the three sons he was the youngest and was deeply religious who sought spiritual guidance from several preceptors of Naqshbandhi Sufi order. He was an orphan at the age of four and thus the hardships of life began while he was ignorant about the life itself. He was brought under the guidance and patronage of Hazrat Nizam-u-Din Khanawari in Muzaffarabad. At thirty he migrated to Wanghat on the instructions of his Pir as a devotee to various shrines. During his travel when he prayed, he got some unusual imprints. After his return when he conveyed the story to his Peer Hazrat Khaja Khannive, the Peer directed him to visit back and settle there forever. Regarding this place at Lar saint Sheikh Noor Din Noorani had forecast that this will be the residing place of a pious and spiritual person who will illuminate the area by his pious deeds. 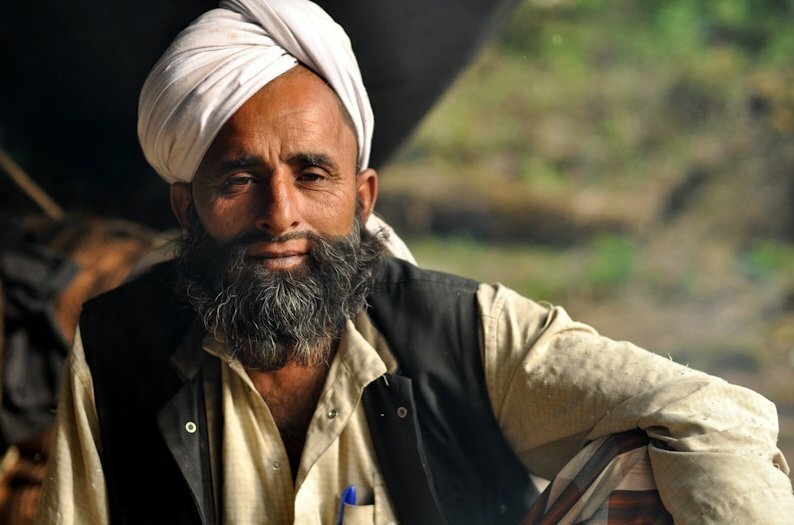 Consequently Ubaidullah migrated in the last decade of 19th Century with a group of sixteen disciples, mostly Gujjars. He settled at Lar, originally a pasture area and uninhabited, above Sindh valley.In the years that followed, he came to be known as Babaji Larvi and the number of his disciples increased manifold. Baba Ji spend his whole life as a simple man helping the needy, poor, sick and ignorant. The desperate and dejected people usually visited him with hope and would return relieved. Babaji held the religious congregations where religious knowledge was imparted to the community. 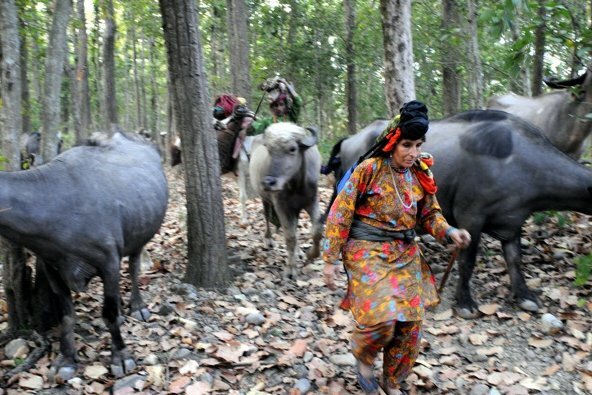 Before leaving to pastures to graze the cattle, tribals visit the shrine to pray for the safety of themselves and their reared cattle. The sick people visit it with a hope of spiritual treatment. He was succeeded by his son Mian Nizam-u-Din who also passed away in 1972. Both are buried inside the shrine. Mian Nizam-ud-Din was the disciple of Babaji who occupied the place after his death. Mian Nizam-ud-Din also lived a life of piety and spirituality. Besides illuminating the community with religious teaching he fought against the money lenders who usually exploited the poor masses. The Urs of Mian Baba Ji Sahib is celebrated in the month of June. The tribal from all over the state come to Wanghat and celebrate it with collective faith. The people from planes also participate in the Urs. The devotees feel a sort of relief from the sufferings of this world at the calm, cool, beautiful, venerated and of course, the prized site of Mian Baba Ji Sahib.The Shrine of Wanghat has always served as a consoling place of disheartened souls. While visiting the shrine which is located in the lap of beautiful mountains, a person feels himself relived from the difficulties of life. The Shrine has remained the great attraction for famous poet Hafiz Jalandari who spent there weeks together. Today when the Urs is celebrated in remembrance of these great saints, thousands of devotes from all over the state have assembled to pay homage to them. The disconsolate people hope and pray for their welfare and well being.